Does content marketing actually work? And what does it look like when it does? We thought we’d ask several content marketers who take their own unique and different approach to content marketing about what works, what doesn’t, and where content marketing is headed. We’ll start with Andy Crestodina, Strategic Director of Orbit Media. They use content marketing in an agency setting, both attracting new clients and providing helpful information to current clients and readers. Hi Andy. Why don’t you tell us a little bit about yourself? I’m the co-founder and “Strategic Director” of Orbit Media, a web design company in Chicago. I write on the Orbit Blog, but I also write for other sites like Copyblogger, The Guardian, Huffington Post, Social Media Examiner, Marketing Profs, etc. 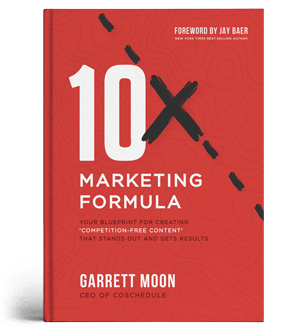 I’ve also written a book about content marketing called Content Chemistry and I speak at a lot of marketing conferences. When did you start content marketing? I’ve been doing SEO and Analytics since 2001, but I didn’t get serious about content until 2007. That’s when we launched the blog and the newsletter. It wasn’t hard to start. I sat down on a Saturday and wrote the first three articles. For the next few years, I wrote an article once a month and slowly grew the newsletter. In hindsight, I should have gone all in earlier. People who blogged a lot in 2007 and 2008 have huge networks now. My excuse? I was busy with work! We had around 20 employees at the time and I was doing almost all of the sales work. Do you have a personal blog outside of your work blog? I don’t and I really don’t want one. I have lots of interests, but if I’m writing, I’m probably looking for a marketing benefit. Once you learn how to write high-ranking blog posts, it seems a little crazy to write something that doesn’t give you that marketing benefit. I love many other things. I take piano lessons, I make little paper mache dragons, I scuba dive. But I don’t write about those things. I write to generate demand and to help people solve their problems! 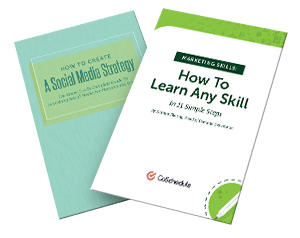 What tools do you use to help you with your content marketing and social media? I also use a web content template for writing. It makes all the difference. Tools are a fun topic, but skills are more important. What you do is more important than how you do it. How big is your content marketing team? There are one-and-a-half of us, Amanda Gant and half of me. That’s it. I still spend a good chunk of time working with the Orbit strategy team, the project managers and with clients. So I can’t dedicate all of my time to marketing. I wish I could! But even with that skeleton crew, it’s enough for us to dominate our competitive little niche (Chicago web design) We generate a huge amount of demand with a relatively tiny budget. What is the biggest challenge you have when it comes to your team’s workflow, communication, and content creation? Sometimes the design team wishes that we’d give them more time to create graphics. We sometimes change ideas just days before a post goes live and if the post requires that we get help from the creatives, they sometimes get cranky. I completely understand. What are the most common mistakes you see people making when it comes to content marketing? A lot of people work very hard to drive traffic, slaving away in the social media salt mines. But they aren’t making the most of the traffic they have. It makes sense to first optimize for conversions before plowing another 100 hours into Pinstagram and Faceworld. Here are some example of very common missed opportunities on websites. Your email signup form stinks. If your signup form is a lonely little box that says “email signup, submit” …ask yourself: why would anyone enter their email address there? It would be weird if someone signed up for your newsletter! Try this: make your email signup form stand out. You don’t need to use a lightbox, but you do need to make it the most prominent thing on the blog. Next, add some evidence that you’re legit, such as the number of subscribers. Finally, tell people what they’ll get and how often. We did exactly this, adding prominence, proof and promise. Our email subscriber rate jumped 1900%. Highly recommended. Your thank you page is a dead end. There should never be a dead end anywhere on your website. Your thank you pages are a great opportunity for “subsequent conversions.” A visitor who took one action is highly likely to take a second action. Give people the chance to subscribe to a newsletter, follow you on a social network or read another blog post. We have an email signup form on our lead generation form thank you page and it captures several hundred newsletter subscribers per year. Bonus! What were you hoping would happen once you began content marketing? Originally, I was hoping to keep in touch with people who didn’t hire us the first time around. We just wanted to keep in touch with past prospects. That was pretty much it. I didn’t really expect I would start collaborating with bloggers around the world, or start speaking at national conferences. I wasn’t planning to write a book. The demand for content marketing help has exploded. I didn’t think it would be this big. Did you set specific goals as far as to what your content marketing would look like, and what kind of measurable results you’d get? Great question. Actually, we set goals for activity levels, not outcomes. It’s hard to predict traffic and conversion rates for content. But we know that if we hit our goals for activity, everything will work out in the end. Here’s a list of our content goals for 2014. We’re mostly on track with these. You’ll notice that we put a lot of emphasis on in-person events. We average around 40k visitors per month and 5+ leads per day. That’s plenty! What three things would you tell someone who was thinking about using content marketing for their brand or website? Write a short mission statement before you begin. Fill in these blanks: [our website] is where [this audience] gets [this information] for [this benefit] Be as specific as possible. If you need help, watch this 3-minute video. That should get you going! Commit to doing something big. Millions of blog posts are published every day. Don’t just add to the pile. Create something inspired if at all possible. Even if it means publishing less often, do something big once in a while. The internet craves originality! You can follow Andy Crestodina on Twitter or on Google+.